The discovery of Arabic characters that spell “Allah” and “Ali” on Viking funeral costumes in boat graves in Sweden has raised questions about the influence of Islam in Scandinavia. The grave where the costumes were found belonged to a woman dressed in silk burial clothes and was excavated from a field in Gamla Uppsala, north of Stockholm, in the 1970s, but its contents were not cataloged until a few years ago, Annika Larsson, a textile archaeologist at Uppsala University, said on Friday. This unexplained extrapolation practically doubles the width of the band, and here’s why that’s a problem…If you consult…a photo of Band 6, you can clearly see the continuous metallic weft of the band turning at each selvedge to enter back in the other direction.If Larsson were correct that Band 6 was originally significantly wider, you would not see those turning loops; you’d see a series of discontinuous single passes of brocading weft with cut or broken ends at each edge. Newbold saw microscopic shorthand symbols in the macroscopic characters of the manuscript text and began his decipherment by transliterating them into Roman letters. A secondary text of seventeen different letters resulted. He doubled all but the first and last letters of each section…The resultant quaternary text was then “translated”: Newbold replaced the pairs of letters with a single letter, presumably according to a key, which, however, he never made clear…Finally, Newbold anagrammed the letters of this senary text to produce the alleged plaintext in Latin. We revere the Voynich, I think, only insofar as it eludes us. The purpose of this new edition, then, is not to provide definitive answers. Instead, as the historian Deborah Harkness has it, the book is offered as an invitation “to join us at the heart of the mystery.” Despite its pages of cramped writing and sprawling illustrations, the Voynich is perhaps the ultimate carte blanche—the purest form of philological fantasy, a canvas vast enough to contain dreams, conspiracies, hunches, and prophecies. In the company of such rich human engagement, a solution—if one should exist—is merely incidental. May the mystery live on. Newbold saw microscopic shorthand symbols in the macroscopic characters of the manuscript text and began his decipherment by transliterating them into Roman letters. A secondary text of seventeen different letters resulted. He doubled all but the first and last letters of each section: the secondary text oritur would become the tertiary text or-ri-it-tu-ur. Any of these groups that contained any letters of the word conmuta, plus q, underwent a special substitution. The resultant quaternary text was then “translated”: Newbold replaced the pairs of letters with a single letter, presumably according to a key, which, however, he never made clear. Newbold regarded some letters of this reduced quinary text as equivalent to one another because of phonetic similarity. When required, therefore, he interchanged d and t, for example, b, f, and p, o and u, and so on. Finally, Newbold anagrammed the letters of this senary text to produce the alleged plaintext in Latin. This seems reasonable enough, although I’d propose a slightly different explanation: Newbold surely must have checked his solutions before publication, and a plaintext that failed to fit known scientific facts was either revised or quietly dropped. Either way, only a genius could have been so misguided, and Newbold’s case is just an extreme version of a tendency that we find in many forms of scholarship. The impulse that led him to see a nebula that wasn’t there isn’t so different from the pitfalls confronting literary critics, historians, biographers, and other scholars with a mass of material on which to exercise their ingenuity and intuition. As Roger Bacon, the real one, once wrote, one of the greatest stumbling blocks to wisdom is “the hiding of our own ignorance while making a display of our apparent knowledge.” Newbold happened to misread his text in an obvious way, but he wasn’t the first—or the last—scholar to fall victim to the perils of cleverness. I don’t think I’ll ever be accused of not having enough strange books in my library, but over the weekend, I picked up a battered copy of one of the most curious of them all: the first and only edition of The Great Cryptogram by Ignatius L. Donnelly, which was initially published in 1888. Donnelly isn’t particularly well known these days, but he’s a fascinating—and peculiarly American—character, an ingenious crackpot who draws on European models while remaining indelibly of his own place and time. He came out of nowhere to become, among other things, the lieutenant governor of Minnesota, a congressman, a state senator, and the founder of a failed utopian community, but he’s best remembered for a series of increasingly odd, and influential, literary productions. His book Atlantis: The Antediluvian World shaped much of the prevailing image of Atlantis as a lost empire that served as the basis of all subsequent civilization, and his Ragnarok anticipates Immanuel Velikovsky, among others, in arguing that a comet collided with the earth 12,000 years ago, altering the planet’s climate and leaving its traces in the myths and legends of a global cataclysm. The Great Cryptogram was his most ambitious and personal project, a massive tome of over nine hundred pages that argues that Francis Bacon was the true author of the works of Shakespeare and left clues to his real identity—in the form of an elaborate code—in the published text of the plays themselves. I first encountered Donnelly’s theory in The Codebreakers by David Kahn, who rightly dismisses it as a pathological misreading, and even at the time, it was roundly mocked. But there’s something weirdly beautiful about it. 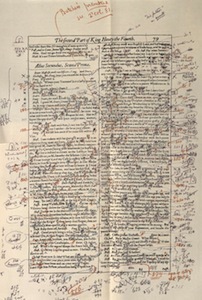 Donnelly reproduces pages from the First Folio and his own notes in multiple colors, showing how he selected the words that spelled out Bacon’s secret message, and it would be hugely expensive to print it even today. (In the end, it was an enormous flop. 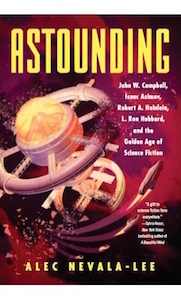 According to Kahn, the book’s publisher had to bring in a special printer to make the plates, and later sued Donnelly for the recovery of advance royalties.) Yet the first half of the book, which lays out the biographical “evidence” for the Baconian hypothesis, could be published tomorrow to an enthusiastic reception. And while I don’t think I’ll ever make it through the whole thing, it’s worth asking why so many people are still so eager to believe that Shakespeare’s plays were written by somebody else. Donnelly’s core argument is a familiar one. Given the linguistic invention, erudition, and worldly knowledge of the plays, it seems impossible that they could have been written by a rural glover’s son. Bacon, a universal scholar with a suitable pedigree, seems like a much better candidate, although conspiracy theorists from Sigmund Freud to Roland Emmerich on down have settled by consensus on the Earl of Oxford. Yet the anti-Stratfordians are obsessed with solving a problem that doesn’t really exist. Shakespeare’s genius, to the extent it can be broken down, rests on three qualities: an unparalleled way with character, a deep intuition and shrewdness about dramatic structure, and a staggering degree of verbal energy and expressiveness. The first two traits have little, if anything, to do with formal education, and the second, in particular, could have emerged only from the daily, unforgiving grind of performance and playmaking—from the experience of a man, in short, who solved narrative problems for a living. And his language required less in the way of rigorous schooling than access to the right books and the determination to use them as tools. Whether or not he actually owned and annotated a copy of John Baret’s Alvearie, it’s exactly the kind of book he could have used, and it would have gone a long way toward providing the raw material he needed. 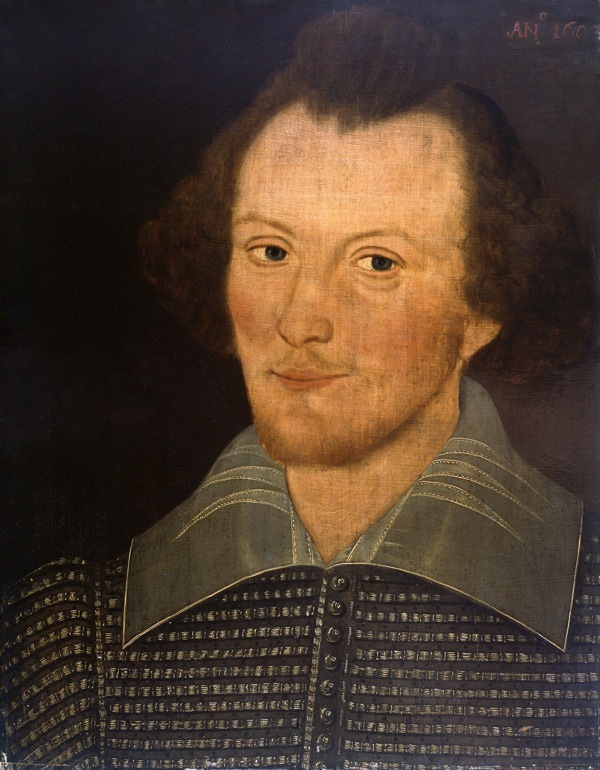 As for Shakespeare’s intellectual or philosophical depth, it’s difficult to imagine a writer with this set of traits—that is, an inhuman facility with character, situation, and language—operating for any length of time without yielding ideas of commensurate complexity, even if we glimpse them darkly, or as flashes of lightning that illuminate the text on the way to the next confrontation. Shakespeare was a machine for generating the kinds of ideas that emerge precisely from language and dramatic incident, a verbal magician whose spells produce resonances that can take a lifetime to unpack, and he did it consistently for a quarter of a century. (He also grew up as a writer in public: when you read all the plays in order, as I did a decade ago, it becomes obvious how the richness of the late works comes out of the lessons he learned from his early, more conventional efforts.) To put it another way, a talent like Shakespeare’s is so exceptional, so statistically rare, that his eduction or lack thereof seems like a trivial consideration: the world’s universities offer up thousands of excellent scholars each year, and their achievements are commonplace, even boring, compared to what Shakespeare possessed that can’t be taught. Donnelly, the Oxfordians, and the rest spin incredible webs of tortured logic to justify what is really the least interesting, and the most explicable, aspect of the works they admire. There’s no need to look for a cryptogram here; Shakespeare is already our greatest maker of codes. I’m half Chinese and half Finnish, with a touch of Estonian, but for the most part, I’ve studiously avoided engaging my own ethnic background in my work. This isn’t because being multiracial isn’t an important part of my identity—as I’ve noted elsewhere, it may be the most important part of all—and it doesn’t mean it hasn’t influenced my writing in subtle ways. The Icon Thief and its sequels are secretly concerned with the collision between East and West, with Russia as its central crucible, and by focusing my energies on another country with its own legacy of cultural tensions, I’ve managed to deal indirectly with issues that mean a lot to me. (Ilya, who is temperamentally half Scythian and half Khazar, is probably the closest parallel in my fiction of a character confronting the two contrasting pieces of his personality.) But the last thing I want is to be categorized as a particular kind of writer. Authors who write about characters of their own ethnicities have a tendency to be pigeonholed by readers and editors, and not without reason: from a publishing perspective, it allows a writer to stand out in an increasingly crowded marketplace, and this applies as much to literary as to genre fiction. At the same time, it limits the kinds of stories you can tell, and as someone who wants to write about everything, I made the choice long ago to approach these subjects as obliquely as I could. The big exception is the character of Lasse Karvonen in City of Exiles. I knew from almost the start that the villain in my second novel would be Finnish, and that his background would become as crucial a part of the story as Ilya’s Russian heritage. This was partially for the sake of convenience, since I had a limited amount of time to plan and research this novel: I already knew something about Finland, and sketching in his history and personality would be fairly straightforward. It also made sense from a narrative perspective. I was getting tired of the endless parade of Russians in these books, and Finland’s history, as a tough little nation pressed up against its much larger neighbor, added an extra level of thematic and personal resonance. A Finn working as an assassin for Russian intelligence would inevitably have a complex web of motivations that I could use. 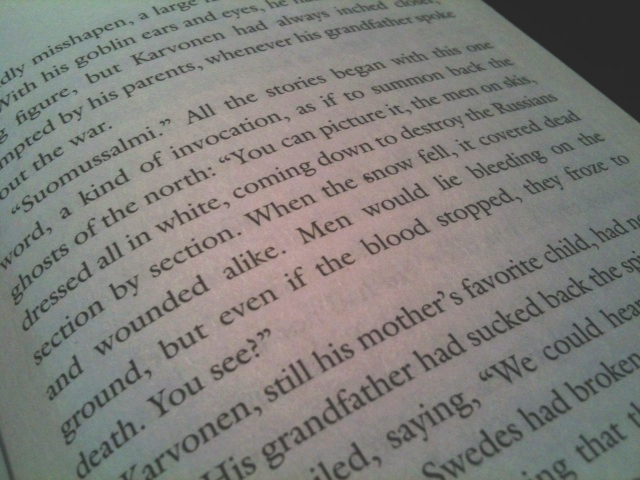 And I can’t deny that part of me wanted to talk about the Finns for their own sake. We know Finland mostly for its saunas, its cell phones, and its excellent healthcare system, but really, this is a badass country with more of the East in its blood than any other nation in northern Europe. There’s an otherness to the Finns that hasn’t been fully explored in fiction, and I was looking forward to giving the world the terrifying Finnish bad guy that it deserved. In Chapter 7, we learn more about Karvonen’s history for the first time, and one of the small surprises of writing the novel was how easily this strand of the narrative came together. Normally, I avoid giving backstory, both because I’m philosophically opposed to the practice and because I’m not especially good at it, but here, it just seemed to flow, and Karvonen ended up having a more fully developed background than any other character in the series. This wouldn’t have been true if he had been, say, Swedish. And making him Finnish gave me access to a huge body of underexplored material. 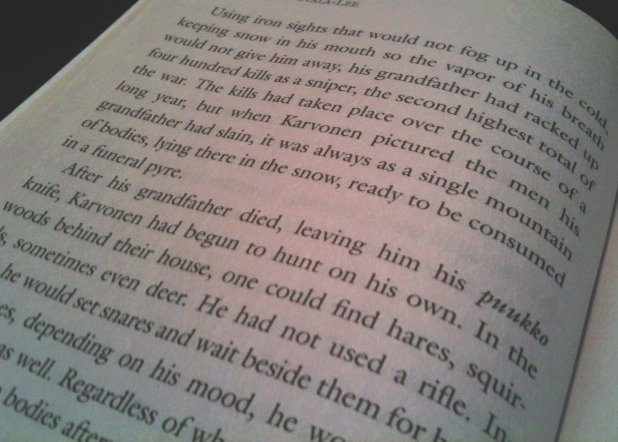 The story of Karvonen’s grandfather, for instance, is transparently based on the real figure of Simo Häyhä, nicknamed “White Death” by the Russian army, who racked up more than five hundred confirmed sniper kills during the Winter War—the highest in recorded history. His description of the Battle of Suomussalmi, in which the Finns set up fake triangles of flares to divert Russian supply drops as the snow covered dead and wounded alike, is based on a similar account in David Kahn’s The Codebreakers. And interwoven with it all is Karvonen’s own dark personal history: the multiple suicides in his family and his fascination with fire and torturing animals, both of which are classic signs of psychopathy.